Nine crews entered the DMack ST Trophy with new entrants Martin Laverty co driven by Phil Kenny and Matt Tordoff co driven by his father Tim Tordoff in the Rallyme clubman spec Fiesta ST taking the series registrations to 16 crews. Alasdair Currie and Steven Brown set a stunning pace and fastest times on the three stages prior to service to hold a healthy lead of 15 seconds from Richard Wells and Calvin Houldsworth. Next up was Jon Ambler and Arwel Jenkins proving his third place on the previous round was no fluke. Sam Bilham and Cameron Fair were fourth not on his usual pace at this point. Rhydian Price and Peredur Wyn Davies broke a drive shaft on stage 1 and Guy Butler and Jamie Mactavish rolled, carrying on to the end of the stage, but the belt driving the power steering and alternator had snapped, so they retired. Tom Easson and ABI Haycock were in fifth place. Martin Laverty and Matt Tordoff sixth and seventh. The afternoon stages saw a complete change in the leader board as Alasdair Currie went out after breaking a drive shaft and Sam Bilham set some stunning times to overtake Richard Wells and Jon Ambler to take the lead going into the final stages. Tom Easson's luck ran out after going off and the time it took to extract the car took them OTL. Richard Wells luck ran out for the second round breaking a driveshaft after proving again he can run at the front. Richard looks forward to the future rounds which he likes and hopes his luck improves. 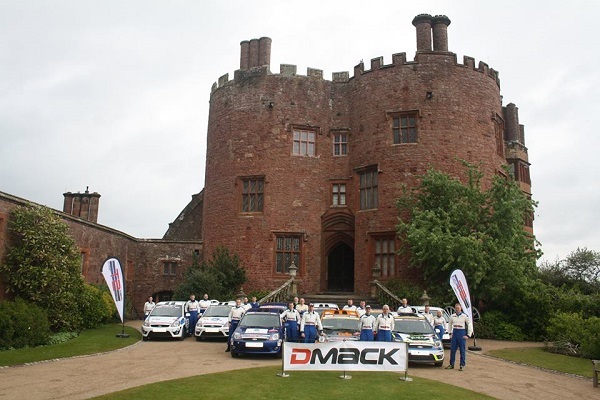 The top three finishers were Sam Bilham and Cameron Fair, second Jon Ambler and Arwel Jenkins, followed by DMact ST Trophy debutantes Martin Laverty and Phil Kenny, all winning DMack tyre vouchers. To keep up to date with DMack ST Trophy news please visit www.facebook.com/fiestasttrophy or www.sttrophy.co.uk.